Harmony of the Seas is the third cruise ship in Royal Caribbean’s Oasis-class. Image courtesy of Royal Caribbean Cruises Ltd.
Harmony of the Seas features three multi-storey waterslides. Image courtesy of Royal Caribbean Cruises Ltd.
Harmony of the Seas was constructed at STX France’s Saint-Nazaire shipyard. Image courtesy of Royal Caribbean Cruises Ltd. The keel for Harmony of the Seas was laid in May 2014. Image courtesy of Royal Caribbean Cruises Ltd. 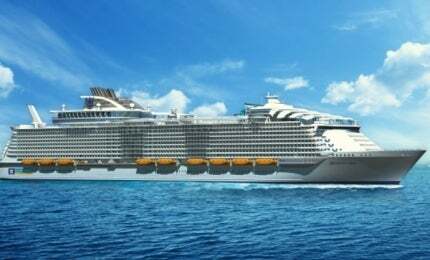 The third vessel in the Oasis Class cruise ships, Harmony of the Seas was built by STX France at its Saint-Nazaire shipyard for Royal Caribbean International. The vessel was delivered in May 2016. It is currently the biggest cruise ship in the world. Royal Caribbean Cruises placed an order with STX France for the construction of Harmony of the Seas in December 2012. First steel for the ship was cut in September 2013 and keel laying ceremony was held in May 2014. Harmony of the Seas will begin her inaugural seven-night Western Mediterranean cruise from Barcelona, Spain, in June 2016. Harmony of the Seas incorporates a wide mono-hull made of steel. It is designed based on Royal Caribbean’s exclusive seven neighbourhood concept, constituting Central Park, Boardwalk, the Royal Promenade, the Pool and Sports Zone, Vitality at Sea Spa and Fitness Centre, Entertainment Place and Youth Zone. "Harmony of the Seas will begin her inaugural seven-night Western Mediterranean cruise from Barcelona, Spain, in June 2016." Harmony of the Seas has a length of 361.79m, maximum beam of 46.93m and a draft of 9.14m. The gross registered tonnage of the 16-deck cruise ship is 226,963t. Harmony of the Seas features 2,747 staterooms carrying 5,479 guests at double occupancy. The accommodation categories encompass Interior, Ocean View, Balcony and Suite / Deluxe staterooms. The interior accommodation is outfitted with exclusive virtual balconies offering an ocean view in every stateroom. Suites offer access to exclusive new areas, including suite lounge, a private suites-only restaurant named Coastal Kitchen, and a full-service Suite Sun Zone sun deck. Guests onboard the cruise ship are provided with RFID technology-enabled Royal WOWBands, which allow them to access staterooms and make purchases aboard the ship. Harmony of the Seas is introduced with a Dynamic Dining concept, which offers guests a variety of dining options than conventional cruise dining style. Dynamic Dining Choice allows guests to choose restaurants and dining times each day and night whereas Dynamic Dining’s Classic option offers two set seating times on a first-come, first-serve basis. The speciality restaurants aboard the ship, including American Icon Grill, Izumi Hibachi & Sushi, The Grande Restaurant, Sorrento’s Pizzeria, Chic, Vitality Café, Boardwalk Dog House, 150 Central Park, Giovanni’s Table, Park Café, Chops Grille, Wonderland Solarium Bistro and Coastal Kitchen offers even more unique culinary varieties for guests. The vessel features the first-ever moving bar at sea, Rising Tide Bar. Bionic Bar on the Royal Promenade features robot bartenders serving cocktails. Other venues that offer beverages include Schooner Bar, Sabor Taqueria and Tequila Bar, Trellis Bar and Solarium Bar. The entertainment venues, including live jazz club, karaoke bar and comedy club, offer shows and other live entertainment. Younger guests can experience a new classic games arcade at Boardwalk neighbourhood while their parents can enjoy the Starbucks café on the Boardwalk. Le Lyrial is the last in the series of Ponant’s four super-luxury sister-ships. Central Park features a variety of name-brand, duty-free shopping and Royal Promenade offers art gallery, shopping for teen and kids, jewellery, perfumes, and apparel. Other entertainment areas encompass teen lounge areas and disco, H2O Zone kids’ aqua park, 3D movie theatre and a VIP Room at Casino Royale. The cruise ship offers three multi-storey waterslides with twists and turns over Central Park ten decks below. The full-service Vitality Spa features thermal suite and an extensive treatment menu, while a state-of-the-art fitness centre offers yoga and tai chi classes. The guests are also offered with four pools, including the solarium, ten whirlpools, two FlowRider surf simulators, two rock-climbing walls, a full-sized basketball court, an ice-skating rink and a mini-golf course. Harmony of the Seas is powered by three 18,860kW Wärtsilä 16V46 16-cylinder main generator diesel engines and three similar Wärtsilä 12V46 12-cylinder engines producing 13,860kW each. The propulsion power is provided by three ABB Azipod electric azimuth thrusters, and manoeuvring is assisted by four 5,500kW Wärtsilä CT 3500 tunnel thrusters. The shipboard electricity is supplied by two MTU 16V4000 emergency generator diesel engines. The propulsion system enables the ship to sail at a speed of 23kt.